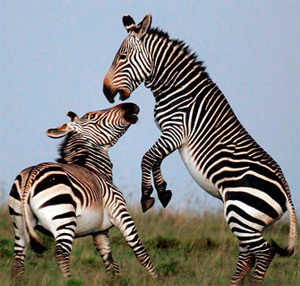 Software able to read zebra "bar codes"
Why try to get DNA from wild zebras to identify them when you can simply check their "bar code"? A new stripe-scanning technique will help those tracking animals better identify individuals. A team of scientists have created a stripe-scanning technique named StripeSpotter that can automatically identify individual zebras from a single photograph. They say the system is more accurate than more traditional image-recognition programs and could be used on other animals with stripes, such as tigers and giraffes. All field workers need do is photograph the animals with a digital camera. The picture can contain several animals. The image is put in StripeSpotter, which analyses the pixels forming the stripes and comes up with a barcode-like identifier for each animal. The findings can then be compared with other animals in the database to find matches. The system tolerates different-sized images and can also cope if pictures are taken on oblique angles. It even works if the image is not taken well, and is under or over-exposed. The work was undertaken by researchers at the University of Illinois in Chicago, Princeton University, and the Ol'Pejeta Conservancy in Laikipia, Kenya. The researchers are to present their findings at the International Conference on Multimedia Retrieval in Trento, Italy, later this month. Feature extraction process. Typical image processing errors can be seen in the top right and leftmost portions of the difference image. The paper on the research can be viewed at here. M. Lahiri, C. Tantipathananandh, R. Warungu, D.I. Rubenstein, T.Y. Berger-Wolf. Biometric Animal Databases from Field Photographs: Identification of Individual Zebra in the Wild. Proceedings of the ACM International Conference on Multimedia Retrieval (ICMR 2011), Trento, Italy, 2011.